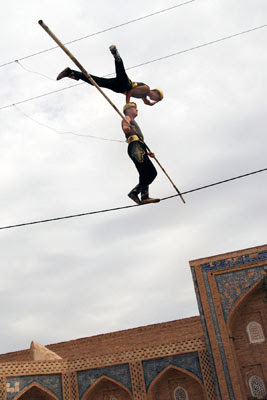 In the courtyard of the Mohammed Rakhim Khan Madrassah, inside the ancient, baked brick walls of Khiva, is the chance to see a thrilling rope walking performance. Nowruz, the spring festival held on 21 March, is the stepping day to spring, and thus dorboz traditionally arrange performances at Nowruz to celebrate their glorious art and demonstrate how nimbly they step, leap and run across the rope. Sometimes blindfolded, sometimes balancing other dorboz on their head and shoulders. In 1955, a rope walking troupe from Andijon, in the Ferghana valley, visited Khiva. Master dorboz Odiljon Khakimov invited local youths to demonstrate their skills. Qadamboy Jabborov, then aged 13, so impressed the master that he joined the troupe's next port of call in Dashoghuz, Turkmenistan, after which he was accepted into the company. A musical number during the performance! He spent the next five years honing his art and entertaining audiences with his daring feats on the rope. In 1960 Qadamboy returned to Khiva to set up his own dorboz troupe. His eldest son, Bahrom, was naturally gifted and began training in various sports to gain the endurance, strength and agility required. Bahrom has subsequently led his sons Alimardon, Ramazon and Khuaybergan through a similar, rigorous training program to perfect what has now become the family tradition. 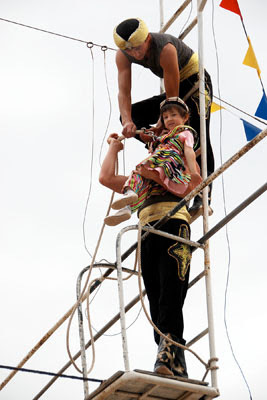 Even four-year old Sadiana is included in the performance, though she must wait until she is six before she can perform solo. And it is not simply rope walking that dorboz learn. They also play various traditional instruments such as the karnay and drums. Dorboz are usually dressed in traditional national costume, either brightly coloured or white shirts and black trousers, tucked into soft leather boots. 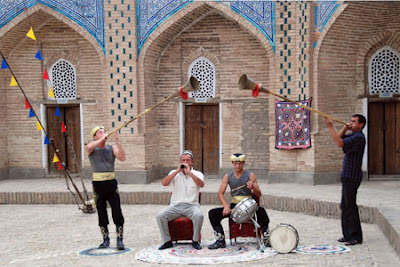 On an Uzbek Journeys tour you have the chance to view a dorboz performance by the Jabborov family. A show is US$35 for a minimum of 10 people. Even if you are travelling solo this would still be $35 well spent. Just drop by the Mohammed Rakhim Khan Madrassah and arrange a time. Images in this post are courtesy of Janet Richardson, who travelled with Uzbek Journeys in May 2012.